For a complete listing of all pieces in this ongoing series, click here. An adaptation of the 1951 one-act play by British playwright Christopher Fry. Four prisoners of war are held in a cathedral turned prison camp. Though the guards are never seen, ghostly voices are heard singing hymns and choral anthems, as if the cathedral itself were a character that participates in the drama. Tensions run high after one prisoner attacks another for making light of their situation and annoyingly playing the organ. As they try to sleep through the night, they awake as dream figures, re-enacting scenes from the Bible (Cain and Abel, David and Absalom, Abraham and Isaac, and The Fiery Furnace), each involving murder, violence, or sacrifice. By the end, the four soldiers are ready to join the heavenly chorus, which slowly fades as morning approaches and the men are finally at rest. Started in January 2018, this opera is in the very early stages of production, with plans for selected scenes to be recorded or staged in Summer 2019. The total running time is expected to be around 2 hours. 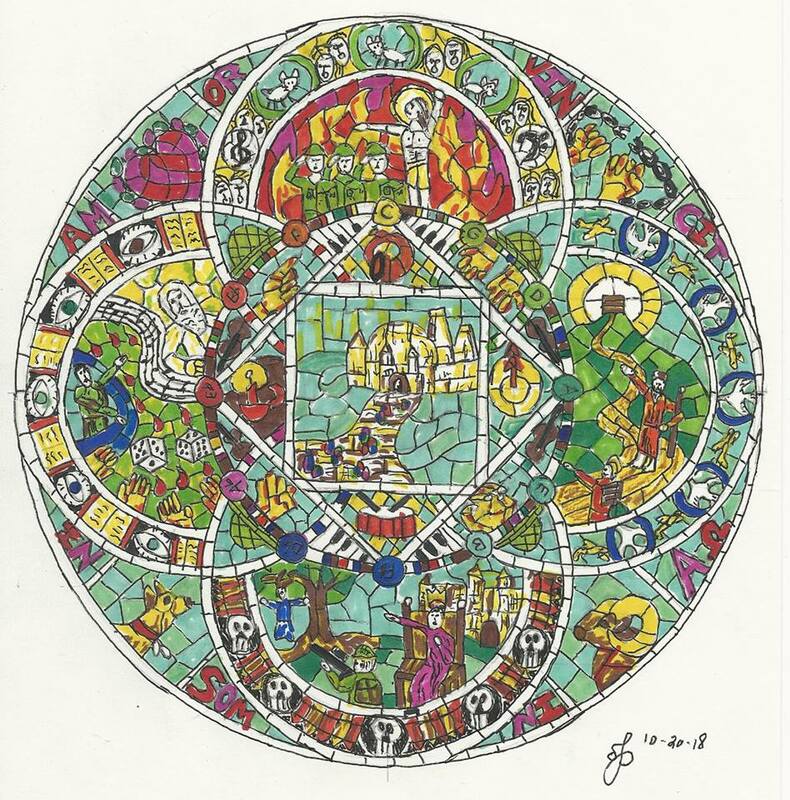 Original artwork depicting the four scenes and other thematic material from the opera, including the phrase "Amor vincit insomnia." Clockwise from top: The Fiery Furnace, Abraham and Isaac, David and Absalom, Cain and Abel. 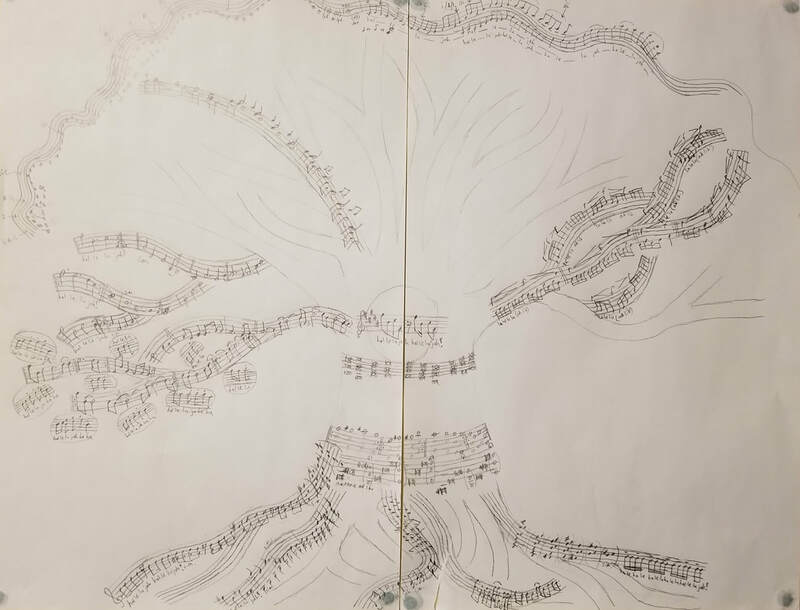 The Hallelujah Tree is an ongoing project for improvising singers with a flex-ensemble of instruments in which cells of music are repeated and alternated, in the manner of Julius Eastman or Terry Riley. Each cell is assigned a function as seeds, roots, rings, vines, branches, leaves, and fruits, which can be used by the ensemble to build patterns and textures in endless combinations for any duration of time. There is no definitive performance or version of this work, with each ensemble determining its own process. Not all of the musical cells are completed and will be continually added to as the work is performed.